There is a lot of talk right now about the need for more high-impact entrepreneurs in Africa, those people who can make a difference on a large scale and find effective and affordable solutions to some of the biggest challenges facing the continent. Sarah Collins, founder of Natural Balance Global, better known as Wonderbag, is one such high-impact social entrepreneur who has created an empowering solution to affordable and safe cooking practices for women, particularly in rural communities, whilst at the same time creating income generation opportunities for them too. LoA spoke to Sarah Collins about her inspiration, her incredible passion for making a difference, and the significant impact that Wonderbag is making in the lives of African women, and indeed women around the globe. My company manufacturers, sells and distributes a revolutionary cooking product known as the Wonderbag. A Wonderbag is based on the oldest technology in the world – heat retention cooking. These non-electric bags are made up of chipped foam that is housed in colourful, African-inspired printed fabrics with a drawstring at the top to retain the heat. This simple but ingenious product allows for food to be brought to the boil by conventional cooking methods and once put into the Wonderbag will continue to cook the food for up to 12 hours. As of November 2015, we reached the 1 million milestone of Wonderbags sold across the world. Needless to say the business has grown significantly after my “light bulb moment” in 2008. It is now an internationally recognised product, but for me it has always been more about creating something that would impact the world we live in and the people around us. Our factory is based in Tongaat, South Africa where the Wonderbags are manufactured and distributed to the various warehouse and retail outlets which makes them available to the public to be purchased. The bags are also sold online and in select retail stores, as well as through Wonderpreneurs in their communities. A Wonderpreneur is someone who earns a living by selling our products and in doing so is bettering their own lives and those of the community they serve. "I am driven by a deep sense that every human needs to make a contribution and leave this world a better place." I am driven by a deep sense that every human needs to make a contribution and leave this world a better place. So many people are searching for their purpose, I am incredibly grateful to have found mine, in innovating simple and culturally relevant products that are changing lives for the positive. Saves time that is normally spent in the kitchen watching over food that is cooking. Just bring your food to the boil, put it in the bag and leave it on a counter to cook to perfection – ready for you to serve hot whenever you’re ready to serve with no risk of overcooking the food! Reduction of external energy source saves you money AND is good for the environment! Increased safety as there is no chance of fires breaking out or burns for children or anyone who comes into contact with the Wonderbag. The heat is retained inside the bag and is safe to the touch externally. Healthier environment for those living in more remote parts where they are still cooking over an open fire as this product significantly reduces the amount of indoor air pollution that is caused when cooking over an open flame which is directly linked to a substantial number of deaths in adults and children under five. 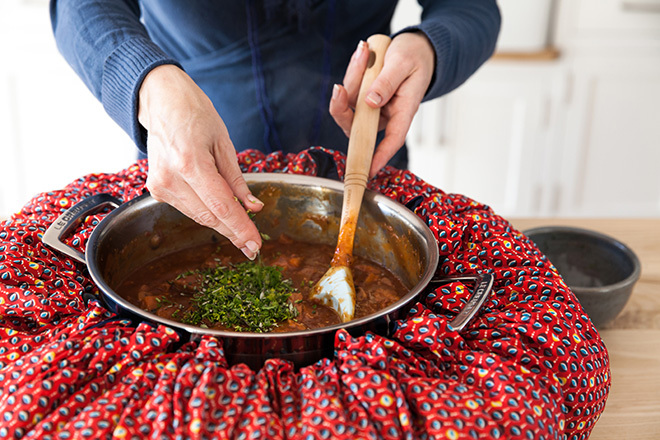 The most delicious and nutritious meals are cooked when using a Wonderbag because this type of slow cooking is a nutrient protective form of cooking where food is cooked to perfection over a longer period of time and with a less harsh form of heat. Economic inclusion – particularly for the ‘last mile entrepreneurs’ of Africa who are able to use this product to now concentrate their efforts on other entrepreneurial activities instead of spending hours of their day bent over the open flames of a fire to cook food for the family. This product also provides the opportunity for people to become Wonderpreneurs and to earn extra income or a living by on-selling the bags, which are sold to them at a reduced rate. The Buy And Give (BAG) initiative is implemented worldwide whereby for every bag sold in any country/region a portion of the proceeds is donated to the Wonderbag Foundation where a bag is purchased and donated to a family in need in Africa. In the US for every bag purchased, the proceeds to cover the cost of a Wonderbag are donated to the Foundation to "Buy" a bag, which is then donated. I like to think of my team as my family, because they are amazing!! They have been with me since the Wonderbag journey began and have continuously supported me throughout the journey. They give one hundred and ten percent every day and for that I am entirely grateful. I grew up in rural, apartheid-era South Africa in the 1970s. My childhood inspired my life’s work focusing on empowering women living below the poverty line through grassroots efforts. Educated in both the UK and South Africa, I spent much of my school years challenging Apartheid. I returned to Africa to launch and run a horseback riding safari business in Botswana, and have since devoted my life to community projects. Among others, my career has seen me run for political office, set-up my own NGO and help local communities create thriving business to support their livelihood. A finite goal that I would like to reach is to have sold 10 million Wonderbags in the next 1000 days! Overall, my vision for the company is to continually grow and possibly expand into parts of the world where Wonderbag has not yet reached. But ultimately through this product, I want to empower the women of the household who I believe are the heart of the community and by doing so to genuinely change the world we live in for the better. "I honestly believe that with the right tools, resources and people in place - we can make a difference!" For me - the facts are simple. Poverty across the globe is getting worse. One billion people will never see a health worker in their lives. Three billion people cook on open flames every day, which is killing them at the same time as feeding them. Less people have access to antiretrovirals than they did 5 years ago. Collectively, the world seems to be failing when it comes to providing health care, aiding refugees, honouring people’s human rights and fighting both poverty and abuse against women. 82% of girls in Africa are raped whilst collecting firewood and this also means that they are not in school in order to complete this vital task. This figure is up from 68% in 2009! Deforestation and charcoal trafficking is at its worst with global warming and climate change being put on the back burner. Fuel for cooking is running out in Africa and rhino poaching and degradation of our natural resources is at an all time crisis! But as gloomy as all this sounds I honestly believe that with the right tools, resources and people in place - we can make a difference! Once we have shown the world that you can make money across the supply chain, hence empowering people with choice, independence and human rights - this will make for a happier and safer world for global children to flourish in. Seeing the proof of the pudding in individual cases where people and communities have given us feedback on how the product has changed their life – that’s what brings me the greatest joy and satisfaction. There is NO rulebook and it will be challenging at times, but if you have a passion for what you do and the determination to succeed then you can take on anything and conquer the world. It’s exhausting and relentless at times, but there is nothing more rewarding than seeing the fruits of your hard labour pay off. I also believe it is important to have a business or personal mentor. Someone who understands you and your business and will give you objective advice but is empathetic too, and who believes in you. Lastly, always trust your gut and believe in yourself! I was told so many times Wonderbag would fail or I wouldn’t have the courage to take it into the marketplace, but look at me now and what Wonderbag has done for Africa.